In these days, the state counselor’s discussion with several leaders of the world has included the word ‘more time need’ to settle the humanitarian complexity of Rakhine state. Very noticeably what the government of Myanmar has been applying the dirty method to the world is “need more time” to be vanishing and becoming extinct the internally displaced Rohingyas and Kaman people along Rakhine state after having long-standing suffering in life-threatening dirty camps. As every person of the world has already known that no sooner had U Thein Sein started gaining the state power through ballot boxes altered way in the year 2010 along the country than the one sided violence led by the Buddhists monks had mushroomed against the Rohingyas, Muslims at large and Christian minority every part of the country, Myanmar. To brutalize Rakhine Rohingyas Muslims and Muslims all over the country, the State Sanga or ‘Buddhist Monk Association’ had created multi-destructive organizations all over the country. As soon as, the subordinate groups receive the directions from the head of the Buddhist Bureau, the sub-coordinative forces who involved the local Buddhist communities would not only usually destroy against “the Muslim societies, their Mosques & religious buildings, the residences belong to Muslims, and livelihoods which they have been carrying for their life-savings. In addition, they would successfully burn the properties of Muslims to ashes, killed many innocent people, and left the societies (Buddhists & Muslims) into long-lasting animosity in the regions at the very sight of local authorities that have been under the green light of central government policies. The starting point of hatred and extreme dislike against Rohingyas and Kaman Muslims of Rakhine were started in 2011 from Taungouk Township, southern Rakhine state. Which has been the famous hillside-loathing township in southern Rakhine state against Islam and Muslim faiths were totally cleansed since 1982 and where the Buddhist hooligans of that township had butchered 11 Muslims in May 2011, along their pilgrim way. U Thein Sein and its puppet regime was thronged to the power by the U Than Shwe, the former Senior General, who has been the prime architect to play all dirty games to spoil the political system of future Myanmar after hijacking the world longest 13 years of periods to be drafting the deceitful constitution. The objective of 2008 constitution is to maintain and rest the future power of the state in the hand of the Military who are the faithful dogs to U Than Shwe, who exploits all properties of the country during his reign for him & his entourage. As more, in accord the constitution, he wanted to be forgiven or exempted from crimes that he and his associates had committed against the entire democratic minded Myanmar people who may one day grab the state power and be able to punish the previous criminals. 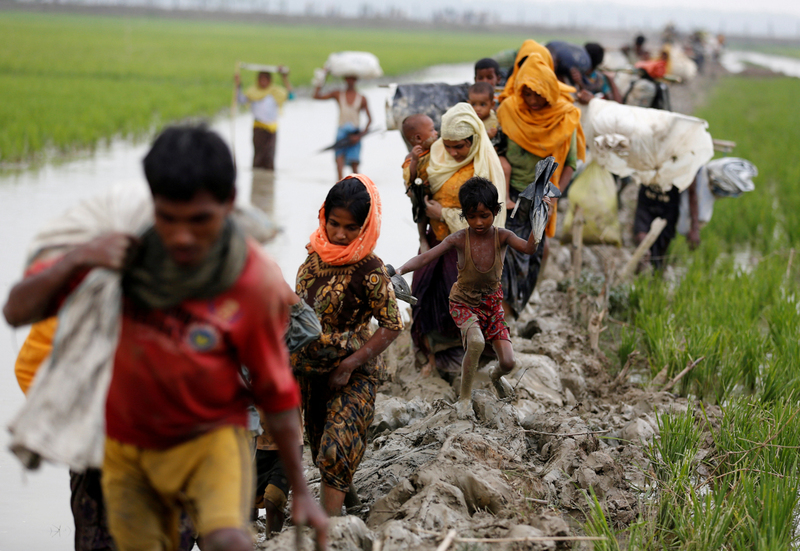 However, the antagonistic and hostile publics have been crying out in regards Rohingyas whom they have foolishly accused as immigrants from neighboring Bangladesh. The former President U Thein Sein and the Immigration minister U Khin Ye have made clear to the public about the Rohingyas (Muslims) that there are no Muslims illegally immigrated in Rakhine state as accused by the Buddhist Monks, Rakhine people and many political parties. Since June 2012, day in day out, entire Rakhine public, political parties, administrative staffers, police department, military battalion have joined to annihilate Rohingyas Muslims and Kaman people from Arakan state. Many Rohingyas and Kaman were herded to outside the townships and they were forever displaced in their localities and since then they have to live in squalid camps, which are out of condition and unsafe to be alive in there as Human. The effected Rohingyas and Kaman people are from Sittwe township, Pauktaw township, Myaybone township, Kyaukpyu township, Yaan Byay (Kyauk Nimaw, a helmet) township, Kyauktaw township, Rathedaung Township, and Mrauk Oo township. The displaced, hopeless, and frustrated people have been restricted their regular flow of basic humanities from outside by the Rakhine extremists who are led by animal doctor Aye Maung, the chair of Arakan National Party, and nowadays the whole Rakhine people are under the trend of ANP party. There have been constant local and international dignitaries’ regular visits to Rakhine state to meet the local monk leaders, public leaders, political figures, and regional authorities to settle the issue, rehabilitating the displaced Rohingyas to their original places but it has never come into reality. Rakhine leaders and that of the public occasional rhetoric statements have been either to drive out the Rohingyas and Kaman from Rakhine state or to force them to agree to accept the NVC cards which is the intentional disenfranchisement. Visibly, all these unacceptable political drive against Muslims of Rakhine were adopted by the central government as the state political tool to please Rakhine Buddhists in the one hand and to be frustrating and disappointing the existing Muslims in Rakhine state from the other. There are some NGOs who take responsibilities to mediate among the factional people in Rakhine state to come to a harmonious settlement, but those NGOs attempts have been failure to get fruitful results, settling the issue for harmonious and peaceful co-existence side by side between two large communities, Rakhine Buddhist and Muslims Rohingyas. Rakhine families and societies are almost pessimistic. The central and Rakhine state governments have reasoned the world body, saying they need a space, more time, which no one knows how many years they will keep the people in IDP camps and what happens to them in these squalid camps. Government demands to show identity by the refugees, to verify as the citizens of Myanmar, who are in amount more than 600,000 in Bangladesh to be repatriated again through the trilateral consensus among Myanmar, Bangladesh, and the United Nations. THAT attitude of Myanmar regime is a blatant cynicism to accept properly those refugees, while many of them could not show the identities wanted by Myanmar government. The government’s inner crookedness and lack of honesty has clearly been shown to the world that it does not want to allow the refugees and resettle to their original locations as per the demand of world community. Seemingly, the current regime initiative is many of whom, the current Rohingyas generation, who have already run away to Bangladesh and be repatriated, were never ever handed the Myanmar citizenry identities though their parents and grandparents may show, and majority will never be able to show the documents, proving the citizens of Myanmar. In reality, the current regime, led by noble laureate neither Daw Aung San Suu Kyi nor none of the former high-ranking officials has been honest on Rohingyas issues. They are all birds of the same flock feather together in the issue of Rohingyas, and there is nothing to keep trust on Daw Aung San Suu Kyi, while she is not an honorable archetype but a modern day chicanery liar as well as enormous killer. Do people of the world realize what the government policy has been on Rohingyas and Kaman Muslims? The entire Rohingyas and Kaman have been the citizens of the nation. No single person is neither foreigner nor second-class citizens such as; naturalized citizens, temporary citizens and associated citizens in Rakhine state. They are all either NRC (National Registration Card) holders or somehow a few Pink (National Scrutiny Card) cardholders. What is wrong with the government? Do all they (Myanmar officials) become a crowd of fool governing body? Nowadays, overall Myanmar governing body becomes in accord English saying: “There’s none so deaf as those who will not hear.” Meaning Myanmar regime has been treating the issue of Rohingya as VERY UNIMPORTANT. As the world community’s not as much enthusiasm in the Rohingya issue, Myanmar regime has adopted a SCHEME of “the more the government demands extra time to be settling the issue, and then the world agrees on this wicked tactic, so possibly the number of displaced people would leave from the camps after having unbearable & miscellaneous sufferings in the camps”. Need more time political ploy has been the depopulation and extinction of ROHINGYA and KAMAN people in Arakan state. Right now after understanding all the heinous plot of Myanmar regime against Rohingyas, not only the state of Bangladesh but also the world Body should not hurriedly agree by any mean to repatriate the Rohingyas refugees to avoid next coming plots of Myanmar in future. While Myanmar is a hostile, aggressive, and unsympathetic nation and that of the majority are pessimistic against the repatriation of Rohingyas to their native land, then the world community should bond firmly that Myanmar government fully accepts upon the world demand to fulfill the standing important procedures to be implemented before Rohingyas to be repatriated to Myanmar again.